Our goal is to provide you with a guide to the leading inshore and offshore Massachusetts charter fishing boats. Please join our top Captains for a fun day of light tackle sport fishing. Click on the boat name to view rates, info and reservations. First Mate is a 31' Rampage Express powered with Twin Turbo Diesels. All tackle and safety equipment is furnished. Captain Randy offers four, six and eight hour fishing trips for up to six anglers or you can customize your own charter. The First Mate is equipped with a galley, enclosed head, stereo CD player and Sirius satellite radio. Randy specializes in big bass and light tackle charter fishing. Seaduced is a "Cape Codder 19". Capt. Robbie's charter boat of choice is the legendary vessel designed and built for local conditions. 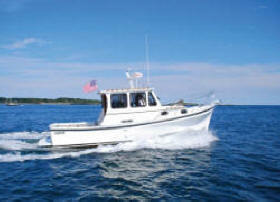 This Cape Cod charter boat can accommodate up to three anglers or two adults with two children comfortably. All tackle is provided or you can bring your own favorite fishing gear. Charter trips of 4 to 8 hours can be arranged with hotel pick-up offered as an additional service of Seaduced Fishing Charters. Lyndsy Liz Bass River Charters provides a Cape Cod fishing experience that is unique and full of excitement! We offer Cape Cod Sport Fishing for the energetic and dedicated fisherman, but would also like the opportunity to share our love of fishing to the beginner. We are centrally located in the Mid-Cape area, fishing out of Bass River, in South Yarmouth, MA adjacent to the bridge where Route 28 crosses the Bass River. Predatuna II is a 35′ JC Sportfisher. It has twin 318 Horsepower turbo-charged diesel engines and cruises at 23 knots. The cockpit is over ten feet wide and easily accommodates a six person charter. It is also equipped with running water, toilet, microwave, toaster oven, fully stocked refrigerator and very comfortable bunks. The latest in electronics, including Furuno GPS, fish finders and radar enable us to offer you the very best technology. Perfect Catch Whether you are an avid fisherman or a family on vacation looking for a great fishing adventure, nothing beats sport fishing on Cape Cod. Join us on the comfortable Perfect Catch as we leave from Wychmere in Harwich Port. While traveling to some of the most productive striped bass fishing grounds, we pass through picturesque Nantucket Sound and along historical Monomoy Island. To ensure a memorable vacation experience, our Cape Cod Fishing trips are tailored to the charter's needs. Shark Shark Tuna charter fishing is located On Cape Cod, in So. Yarmouth, Ma. Captain Shane is one of the Cape’s premier charter fishing captains, targeting species such as Blue Fin Tuna, Striped Bass, Sharks, White Marlin, & Yellow Fin Tuna. We fish waters from Stellwagon Bank to the Northeast Canyons, and inshore in Nantucket Sound and Cape Cod Bay. These inshore waters can be very productive for species such as Bonita, False Albacore, Weak Fish and the occasional Spanish Mackerel. Our fishing techniques include trolling, drift fishing, kite fishing, spin cast, and vertical jigging. We offer both live and artificial bait depending on what species is being targeted and use only top of the line gear. All fishing gear is provided on the boat. Our season runs from June to October with both morning and afternoon trips. Overnight canyon trips are also an option.